Mining in New York began as soon as people entered the region after the retreat of the last glacial period. Specific, widely known, sites were established to extract natural resources for many purposes. Native Americans extracted chert for projectile points, clay for pottery, and red, yellow and black iron and manganese minerals for pigments. Various types of stone were used for jewelry, decoration and tool making. Native Americans recognized salt from briny springs in Onondaga County. The modern history of mining in New York State began in the southeastern part of the state. Mining spread, with the European settlers, up the Hudson Valley and into the North Country and westward through the Mohawk Valley to western New York State. Not all portions of the state are equally endowed with mineral wealth. 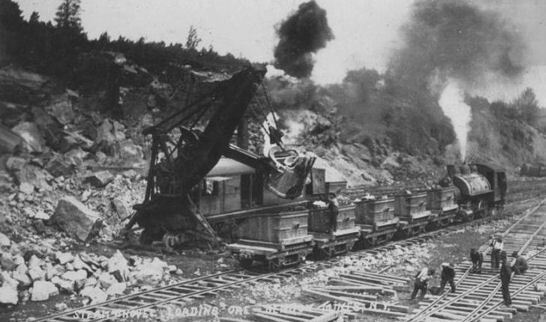 Consequently, many more mines were established in regions such as the Hudson Highlands and Adirondacks than in the Catskills or Southern Tier. Iron was first extracted from “bog” deposits. These were small pockets of limonite (FeO(OH)) that were literally deposited in swamps. At the same time, limonite occurring in weathered pockets of rock in the Hudson Highlands was used for ore. These deposits soon proved to be too small and lean and further exploration revealed many deposits of magnetite (Fe3O4). This mineral became the iron ore of choice. The ore was reduced to metal in local refineries and used for cookware, tools, weapons and construction materials. Earliest iron mines of this period were located in Columbia and Orange Counties. Lead and copper were also metals that the people of the colonial period sought. Galena and chalcopyrite were mined in several counties in the Hudson Valley and in the Mid-Hudson region. The lead ore mineral galena also contains traces of silver and unsuccessful attempts were made to establish mines for the latter metal. New York State’s mining industry achieved its greatest extent from the 19th century. 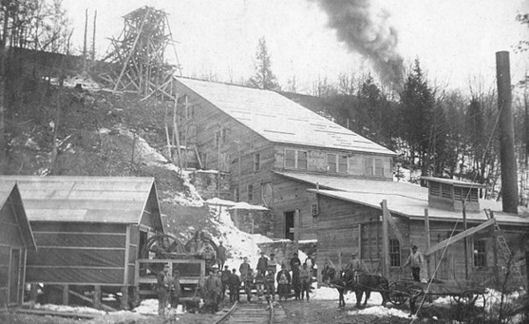 The center of iron mining migrated from the lower Hudson Valley to the Adirondacks although the Mid-Hudson limonite mines and siderite mines still produced iron ore. At the time of the Civil War, iron from the Adirondacks constituted twenty-five percent of the nation’s production and was critical to the war effort. During the period from the end of the First World War to the beginning of World War II, mining in New York State generally declined. Graphite mining ceased. Because of the necessity of a domestic source for certain raw materials, large iron mines in the Adirondack counties of Essex, Clinton and St. Lawrence were rejuvenated. 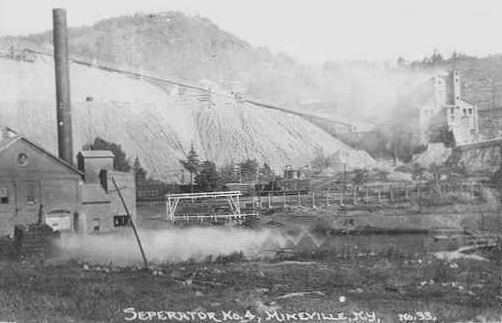 From 1938 to 1945, more than eight million tons of ore were produced from the mines at Mineville, Essex County, alone. A nineteenth century iron mine at Tahawus in Essex County was reincarnated as an ilmenite mine to provide titanium dioxide, an essential component of paint pigment and chemical smoke screens. These mines remained in operation for as much as forty years but all were closed by 1982 and neither iron or titanium were being mined in New York State by the beginning of the twenty-first century. The last of the gypsum mines closed in 1999. Mines for sphalerite, a primary zinc ore, were established in 1920 and continued to operate in St. Lawrence County until 2008. Clinton Iron Ore Mines - Clinton, N.Y.